Y'all must know how much I sincerely love beets. I find them visually inspiring and enjoy eating them raw or roasted. This week I decided to try something a little different - beet soup. The color of this lovely winter meal is just gorgeous, and, with a bit of ginger and cayenne added, it's great for a little liver detoxifying as well! Now, I'm definitely not a nutritionist, but I can tell you what my body knows about beets. When I've had a long night of partying or spent a week indulging too much at holiday parties, beets are my go-to remedy. These juicy red roots always help with my digestion and do a great job of, ahem, clearing out the system. Full of fiber, folate, betanin, nitrates and other great plant nutrients that are said to be good for the body, beets supposedly help to strengthen the liver and therefore clean up the blood stream. 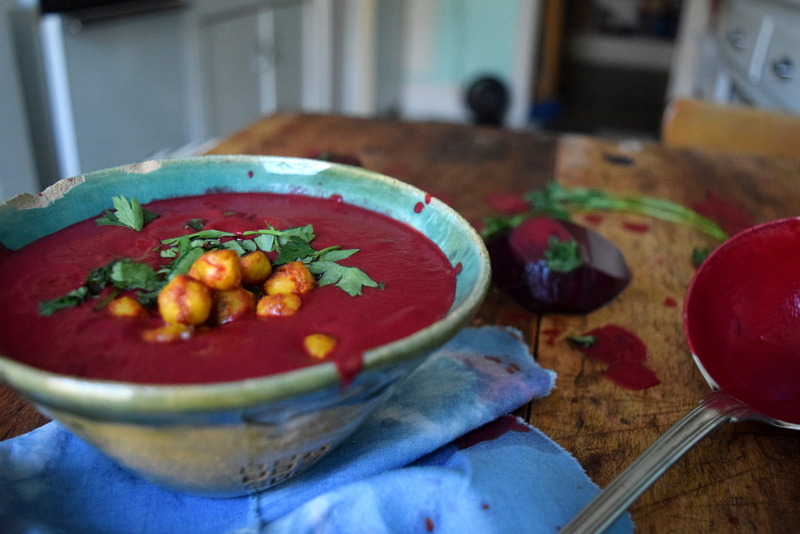 So this weekend, after a raging Friday night, or this holiday season when plates are full of rich foods, try out this recipe and settle in for a bowl of steaming, detoxifying, delicious beet soup! Prep time: 10 minutes. Cook time: 45 minutes. Skin and chop beets into cubes. Chop celery, onion into similar sized chunks. In a mixing bowl, add chopped vegetables, garlic cloves, ginger powder, cayenne pepper, salt, olive oil and coconut oil (in it's melted form) and mix with a spoon until all vegetables are coated. Transfer coated veggies onto a baking sheet lined with parchment paper. Pour remaining oil/spices from your mixing bowl over the top. Spread veggies out on the baking sheet so they are evenly distributed. Roast in the oven for 15-20 minutes (until soft enough to poke a fork through). Once veggies are finished roasting, transfer to a large pot. Add vegetable broth and fresh ginger slices and bring to a boil, then let simmer for 10 minutes. Slowly stir in coconut milk. Grab either a blender or an immersion blender. I just got a fancy schmancy Vitamix, which I must say, is amazing for making blended soups! A regular blender will work just fine, but be sure to only fill it halfway in order to avoid spillage and burns. With whatever blending tool you have on hand, process soup until desired consistency is reached (some people like it smooth, others like it chunky, who am I to judge?). Simmer blended soup for another 5-10 minutes then serve. 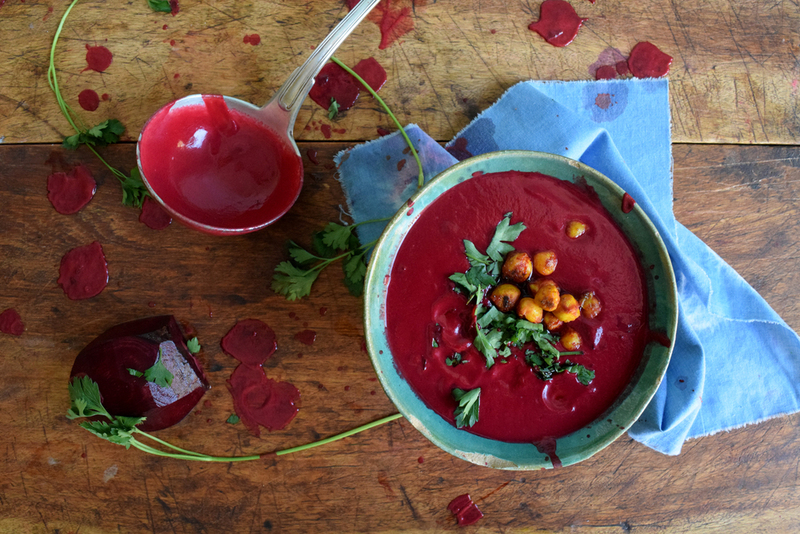 My Vitamix made this soup incredibly smooth, so to add some texture, I topped bowls of beet soup with chopped parsley and fried chickpeas. For the chickpea recipe, you'll have to sign up for my bi-weekly newsletter! Just scroll to the bottom of this page, enter your information, and eagerly await exclusive recipes, photos and discounts from me. If you don't have any coconut milk on hand, or aren't a fan of creamy soups, feel free to replace it with 1/2 cup more vegetable broth. I would also recommend slightly reducing the amount of ginger powder and cayenne you use as the coconut milk balances out the spiciness.